The month of November is the month we share our gratitude for the good in our lives; especially what brought that good to us – the Lord, family, friends, that one opportunity. In this season it’s all but impssoble to forget that we ought to be grateful. Reminders pop out everywhere, all season long. But sometimes its hard to remember that we are to live each day full of gratefulness. And it can be even more difficult to remember to express that gratitude amidst the sea of life’s complications. 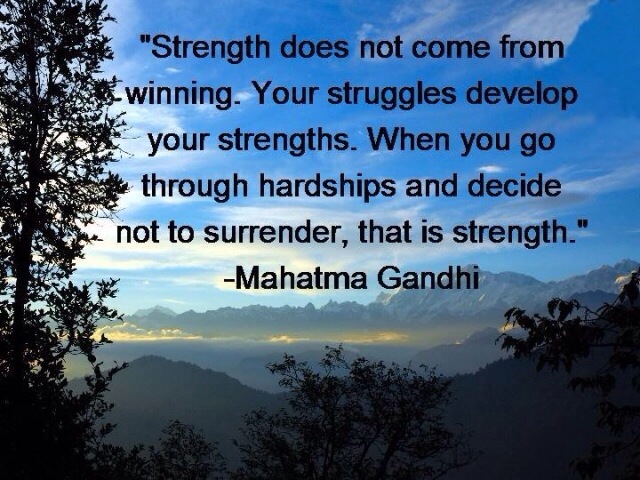 Life gives us as many tough days as good days. And there are days where the challenges and tougher aspects of life can blur our ability to recognize the good. The truth is, it is hard to be happy and grateful when you are facing so much sadness and discouragement. And while it is hard to run when you are weighted down with cares of the world on your shoulders, I am choosing to focus my perspective on the good. With that in mind I will focus my season of 30 days of thankfulness with these 30 thoughts. I will think on these thoughts when my sight begins to shift. These are what has brought me to where I am, what has shaped my life. While in the moment they were far from easy, the lessons I learned through them have greatly improved my life. 1. I am thankful for the times that I have been hungry. Because of them I never assume the pantry will be full. 2. I am thankful for the times I have been cold. Because of them I will never fail to appreciate the fuel in my tank and the heat that comes through those vents. 3. I am thankful for the people who laughed at me. They helped me not to take myself too serious. 4. I am thankful for the people who have criticized me. They help me to really be sure of the things I do. 5. I am thankful for the people who have bested me in the competitions. They made me realize that winning is done before the game in the preparation. 6. I am thankful for the employers who did not pay me enough to live. They made me reach for better so that I could provide for my family. 7. I am thankful for those who used me and worked me hard and sent me away with only a thank you. It is because of them that I learned that my livelihood was not based on the kindness and the goodness of men but on God. 8. I am thankful for those who forsook me and left me alone. They helped me to understand that no one should be left alone and to stay as long as I can with a friend. 9. I am thankful for the leaders who ignored me. They helped me to understand that everyone has value and possibilities. Invest a moment in someone who looks insignificant and the significance will be revealed. 10. I am thankful for those who would not give me the time of day. Through them, I learned that if people were too big to help they were too small to look up to. 11. I am thankful for the automobile breaking down. That taught me the value of maintaining the things I depend on. 12. I am thankful for unanswered prayers. If God would have answered most of my prayers as I asked, I would be in a mess today. 13. I am thankful for the times my family was angry with me for something I did or did not do. I learned the value of family and that I was most often acting selfish. 14. I am thankful for the people who cheated me in some of the deals we made. They taught me to always be sure of any negotiations and never assume. 15. I am thankful for the people who fell asleep during one of my sermons. They taught me to prepare so that I was interesting even to uninterested people. 16. I am thankful for the bullies in my life. They taught me that the pain of the punches were not as bad as the pain of not taking them. 17. I am thankful for the people who tried to push me out of places I was serving. They taught me that I was not serving them, but serving the Lord. Since I am serving Him – He never pushes, He always leads. 18. I am thankful for the financial bills that have come due when I did not have the funds to cover them. That taught me to plan and pray so that either I did not put myself in that position and that I could trust God while I was there. 19. I am thankful for the pastor who scoffed at the idea of me being a full time pastor. He made me really feel the humility needed to depend on The Lord and not my own ability. 20. I am thankful for the leaders who scolded me for some of the things I did wrong when I was doing my best. They taught me to be sure, to check and to work toward excellence in everything I do. 21. I am thankful for the folks who quit talking to me or associating with me after I left some of the positions I have held. They taught me that real friendships are not indicated by those close to you at the top of life’s mountains but those walking with you its valleys. 22. I am thankful for the diagnosis of cancer. It taught me more than a few things, but not the least of which is the value of life. It taught me to appreciate every day you can be with your family and friends. 24. I am thankful for the times I failed miserably when I spoke. I learned that without the Lord’s help there was no reason for me to be on the stage. 25. I am thankful for the leaders who let me down. Their failures taught me that even those you look up to are just men. Some of them were not even good men, which has made me realize all the better to be a man first and a leader afterward. 26. I am thankful that all my friends will never be friends with each other. That has taught me that it is okay to love people who are different from one another. They also taught me that being true to yourself is not being just like anyone else. 27. I am thankful for those who were jealous of my achievements and intentionally or unintentionally tried to disparage me. They taught me to be poised, quiet and diplomatic; that who I was would not be determined by others feeling about me, but my own actions and reactions. 28. I am thankful for those who have questioned my integrity. They have made me question my own integrity to see if I was made of the right things and living the right way. 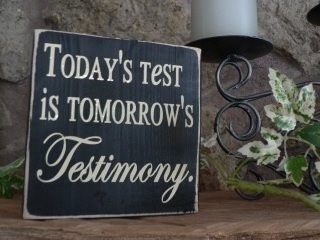 Testing your life is better than failing in life! 29. I am thankful for those who have looked down on me and have let me down in life. Their actions taught me to look higher than people and how to wait on Christ to lift me up. 30. I am thankful that all the mistakes, miscues and misgivings of life did not sour me or destroy me. I know that everything mixed together both good and bad to make the final product. I was not made for my own ends but for Christ and then to be given back to others in His service. So, I am thankful for these experiences that have bought wisdom. I hope I am wise enough to not forget the lessons of yesterday’s mistakes, and able to deal the the rest that I will make along the way. 1 Thes 5:18 *give thanks in all circumstances; for this is the will of God in Christ Jesus for you. 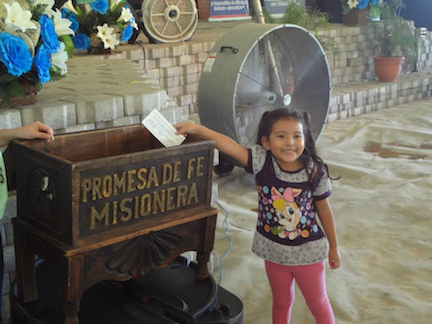 Even Missionaries give to missions and raise up Missionaries! “Do we give more or less? Who do we cut from our missionaries?” Don asked our congregation on Sunday at the Dream Center. 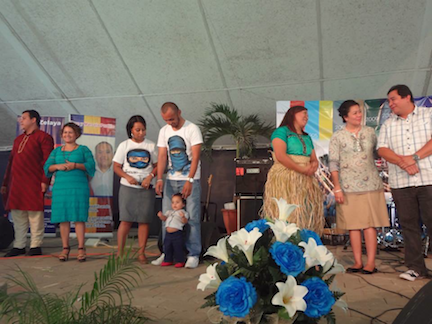 It was our 10th Anniversary for the church, and we always have a missions convention. But giving has been down, and not everyone had completed their missions pledge for the year. Very true. 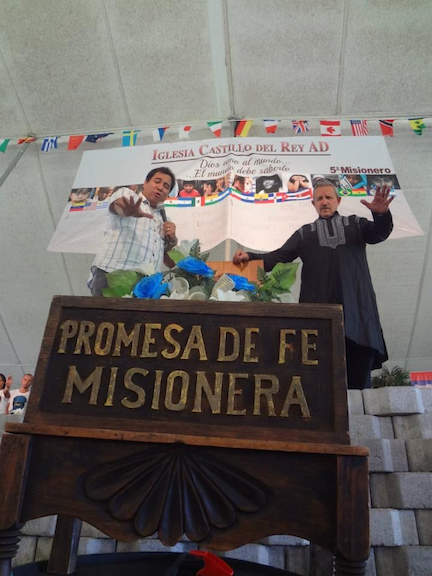 More than 90% of our General Appointed Salvadoran Missionaries started out in Castle. They were in Master’s Commission. The third year Master’s Commission students do a missions internship in another country. And from there, many are called to be missionaries in full time ministry after leaving our program. Many were pastors at the Dream Center church as well. About 10 or more missionaries attended our service on Sunday, lined up front. Liz and Justin sent a video greeting from Thailand. Don preached about Faith Promise from Hebrews 11. “Now faith is confidence in what we hope for and assurance about what we do not see.” Don began to list the heroes of the faith mentioned in Hebrews 11. 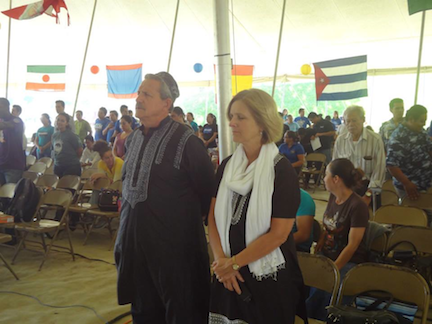 And how by faith God called us to El Salvador to start King’s Castle Ministries. Believing in something not yet seen…but believing in the promise that He had given us. 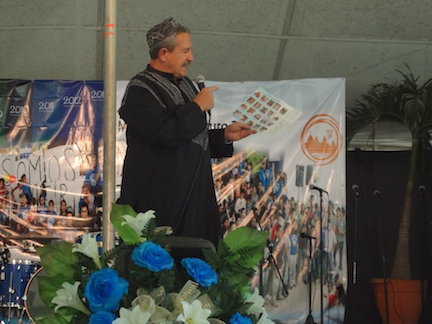 Then he began to list the “heroes of the faith” from El Salvador—our missionaries. Our missionaries who are working or will be working in India, Thailand, Cambodia, Afghanistan, Albania, Italy, Romania, Niger, Tonga, Belize, Venezuela, Peru, Nicaragua, and the list goes on—all started originally working with us in King’s Castle. The goal was $25,000 in Faith Promises. Remember, our congregation are people who are the poorest of the poor. In El Salvador, minimum wage is about $240 a month—if they have a job. I know one lady in our church who gets minimum wage, and she still gives 20% of her wage each month—10% tithe and 10% missions pledge. I’m not sure how she does it. A child putting in her Faith Promise Pledge! Today, I’m thrilled to report that $29,280 has come in so far for Faith Promises, and not all the pledges are in yet! I have been thinking lately of a few scriptures that I think have been misused and misapplied to disagreements among brothers of the faith. I think there is a real difference between mature men in the faith disagreeing and someone sinning against a brother. Matthrew 18: Moreover if thy brother shall trespass against thee, go and tell him his fault between thee and him alone: if he shall hear thee, thou hast gained thy brother. But if he will not hear thee, then take with thee one or two more, that in the mouth of two or three witnesses every word may be established. And if he shall neglect to hear them, tell it unto the church: but if he neglect to hear the church, let him be unto thee as an heathen man and a publican. This passage gives the process of how to deal with an notable and significant offense among two brothers. First, is this offense something large enough that it cannot be removed in your personal time of prayer by releasing it to The Lord? Have you even prayed about it? Are you really letting something small become a mountain? Sometimes we just need to “man up” and know that things happen unintentionally. Let it go and release it to The Lord. By doing this you allow the Holy Spirit to mature you and you allow the Holy Spirit to work in your brother. Second. If it something that you feel must be approached then you are to go to the offending brother. Not to accuse but to to arrive at the place of reconciliation, forgiveness and healing. 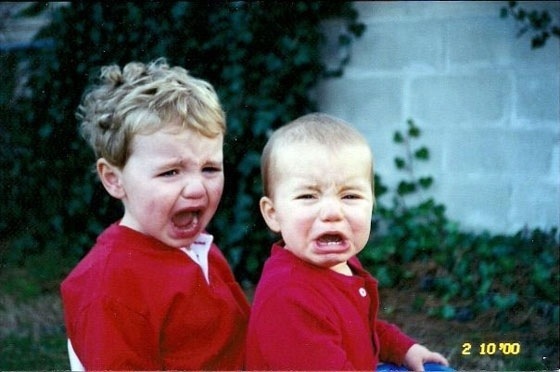 Third, if the offending brother is not approachable then after a season of time bring others into the communication. Again, not to harass but to bring reconciliation, forgiveness and healing. At this point it is also to expose error which could bring division not only between you and him but he and the body of Christ. There are more steps that I think should be approached carefully but I want to go on from this to where I am seeing some misuse of this passage. It seems that this passage is used by individuals in roles of authority to reprimand those who serve with them or below them for calling out concerns with leadership decisions. God does lift men into leadership roles to help the body. These offices should be revered and honored. Loyalty should be afforded at every junction possible. But here is where I am concerned about leadership. It has never been the individuals right of leadership to not be open to the critique of his fellow brother. No man is set in a position to live and rule empirically over the body of Christ. Especially in a democratic form of church government. If that is the chosen form of government of the church body, then honor the process. Men are chosen among their peers to serve their peers as the ministry serves the church. These individuals are special for the season of their service. This is not because of the position but because of the confidence placed in them by their fellow members. Since they are placed in leadership by them, then leadership should be administrated to help find the will of God for the church, with them and not without them. Leaderships challenge is to move others to the place God is calling them to go. That will be impossible without consensus, clarity and communion. The Apostle Paul challenged Simon Peter publicly in Galatians for his public hypocrisies. He did not go privately because Simon Peters errors were public and too significant not to call out so that others would not practice the same actions. This was not for reconciliation, forgiveness or healing. This was for correction to the body of Christ where Simon was leading. Galatians 2:11 When Peter came to Antioch, I opposed him to his face, because he was clearly in the wrong. Before certain men came from James, he used to eat with the Gentiles. But when they arrived, he began to draw back and separate himself from the Gentiles because he was afraid of those who belonged to the circumcision group. The other Jews joined him in his hypocrisy, so that by their hypocrisy even Barnabas was led astray. When I saw that they were not acting in line with the truth of the gospel, I said to Peter in front of them all, “You are a Jew, yet you live like a Gentile and not like a Jew. How is it, then, that you force Gentiles to follow Jewish customs? Simon Peters response is not noted in the passage, but we can assume he humbly fell in line with his brothers correction. Why would he not fall in place? His brother in the Lord, his fellow servant and laborer for the gospel, was telling him the truth. Paul was concerned with the greater good of the Church and the truth of the Gospel. Truth and righteousness was more important than any one man’s feelings or role. This was an issue that was central to the Gospel and demanded attention. I personally do not believe administrative, organization structures or any other human form of government would have been on Paul’s radar nor on the Holy Spirits mind. I think we even today are too concerned with those things that are merely tools rather than tasks mandated by the Holy Spirit and the Word of God. If those who are having to live with the administration are happy then be happy and vote among yourselves those forms in place. Let God get glory out of the Gospel and don’t allow the Gospel to be hindered by administration or lack thereof. What if Simon had quoted Matthew 18 to Paul? He would have been in error. He would have been marginalizing a man God had made his equal. He would have been making a mistake that would have been detrimental to the body of Christ. Never demean, defame or demonize your brethren because of disagreements. Contend for the truth and allow the Holy Spirit to bring unity and communion. Leaders, we do damage to our God given leadership roles when we place ourselves in a superior role to our brethren. A position is not ours to use as a place to shut down dialogue and debate. Allow others to contend in a biblical way with the operation of the Church. If as a leader one still feels that God is directing down a certain path, then do it with the blessing of both those who agree and disagree. But never use the scripture to make those God has raised up and used as men who sin or stir strife. Godly men want the best for the Church and it’s leaders. Even Paul and Barnabas separated in their physical work but continued in the work of the same Gospel message. Disagreements arise and as time passes those disagreements vanish and are forgotten. To shun others because one is insecure with others questions is below the office of the leadership one have been chosen by their brethren to serve in. Never use the scripture that deals with offenses among believers to be an obstacle to opposition of ones organization or administration. A brother sinning against a brother is different than a leaders leadership among ones peers. Sin separates us from God and each other. The Blood of Christ unites us and administrative differences should never sever brothers from each other. We might not can work together but we can walk and worship together. We may not care for each other’s leadership style, organization or administration but that is not equivalent to the bond of the Blood of Christ among us. May we all be hid behind the cross and never place anything if front of it! Why Do Bad Leaders Always Seem to Win? Why does it seem that the very worst bosses – the bullies, the egomaniacs, and the bad leaders – always seem to come out on top, leaving a trail of victims (and broken organizations) in their wake? Authority Rules. As much as we hate to admit it, we are still very hierarchical. We defer to authority, as illustrated by Stanley Milgram’s shock experiments – where people were willing to punish another with painful electric shocks, merely because an authority (a scientist in a white lab coat) told them to do so. Authority is often given a “free ride.” We are reluctant to question authority, even when it is clear that a leader is abusing his or her power. Bullying and Intimidation. Many bad bosses are simply the adult version of playground bullies. They carefully pick targets for bullying, knowing full well that the targets are unlikely to retaliate, and bystanders will not intervene because they fear becoming the next target. Bad Bosses Play By Different Rules. Power can become intoxicating, and the very worst leaders are “powerholics” – reveling in the control that their position allows them. Bad leaders develop a sense of entitlement. They believe that they are “above the rules” that govern others. Bully bosses don’t see what they do as bullying. Even worse, the bad guys believe that the ends justify the means. In other words, lying, cheating, even stealing are ok, as long as the bad leader comes out on top. Poor Organizational Processes. What research shows us, and what I have found in my consulting with organizations, is that when a company has a high percentage of bad bosses, there are usually poor human resources practices in that organization. Top management is out of touch with the rank-and-file, and often doesn’t even know that the bullies and bad leaders exist (or they look the other way). Performance evaluations (particularly of bosses) are non-existent or poorly done, and selection and promotion processes are pitiful. Lack of Good Followership. This is going to sound like blaming the victims, but is really a call to action. All too often, workers feel powerless, intimidated, and incapable of doing anything. These are the same feelings that the bad leaders cultivate and thrive on. Followers need to individually step up and take action, and to band together. Remember: unions didn’t develop because bosses were treating workers well. Take Action. You would be surprised at how many bad leaders are never challenged. People may assume that management knows about the bad leaders and bullies and refuses to take action, but that may not be the case. Yes, in toxic environments, the bad leadership may go all the way to the top, but in many instances the bad bosses go undetected because they are never called out. A diffusion of responsibility occurs and everybody expects others to take action. If everyone were to take action, the incidence of bad leadership would diminish rapidly. Stop Them Early. This is critical. Once a boss has been in place for a long period of time, it becomes more difficult to dislodge him or her. That is because there is a tendency to assume that long tenure means competence and good performance. Moreover, the very worst bosses quickly learn how to “play the game” – operating under management’s radar screen, and building a system of allies and cronies to support and spread their toxic behavior. Find the Good Leaders. These are the leaders who will provide support and help fight the bullies. Why? Because the good leaders care about the organization and the people in it. You might be one of these people. If so, step up, take action, and help lead the fight against the bad leaders to make your job and organization better. Leaders lead, Shepherds Guard and servants Serve. I am a wary sort of fellow when it comes to leaders, Shepherd’s and servants. I can most times just leave well enough along until I feel like I am being pushed, bullied or manipulated. I have never felt it necessary to go down the road very long with folks when I thought they were either using me or bulling me. I committed my life to follow The Lord and His servants but when I feel that the two are not going down the same road I have always and will always follow the leadership of the Holy Spirit, the Word of the Lord and the Ways of The Lord. I will listen and watch quietly and even leave quietly but I will be forceful if gone after. I am not a sheep, a child or a slave, I am a man of God. I will follow like a sheep, obey like a child and serve like a servant when I see Christ in those I serve. But I am a man who has chosen to think and to decided to follow God with my mind as well as my heart. When folks use scripture to manipulate you, your friends to scorn you and isolation to punish you move forward with a sincere heart. I have learned to ignore those things and focus on who I am following. Is it painful? Yes! But much better than finding out you have wasted your faithfulness, followership and fellowship on the wrong things in your life.